Prior to my showing of "August Winds" at the Chicago Film Festival, its lead actress, Dandara de Morais, was introduced and made mention of it being not only her first film but the first non-documentary film of its director, Gabriel Mascaro. Even if she had not offered this informative tidbit, it would have been easy to surmise as the film is clearly less concerned with narrative than National Geographic-ism. 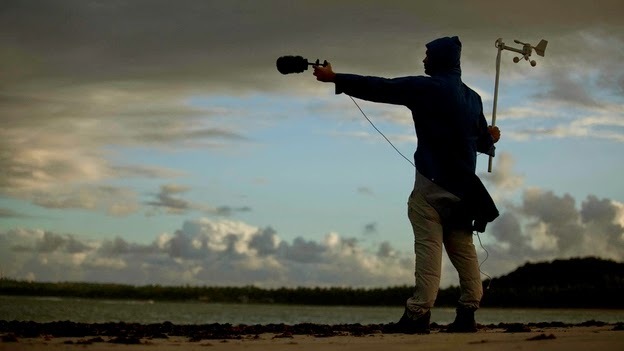 Set in the Alagoas of Brazil, Mascaro effortlessly captures the sensation of a specific place on camera, of thunderstorms gathering on the precipice of the Pacific, occasionally allowing for cascades of rain to blot out the camera, as if we're watching in a poncho under a useless awning, and reveling repeatedly in towering palm fronds that its characters sometimes scale. But then, it's not merely a travel brochure on celluloid. Those palm fronds are routinely the backdrop for hard labor, busting up coconuts and then hauling them on a tractor trailor, and with those rains come the tide and the wind, and with the wind comes a kindly mystery man (Mascaro) recording the wind for reasons that don't much exist beyond "Need More Story Here". He conveniently swoops in simply to wash up onshore not along after, dead. This is where the story, as it were, finds its (miniature trickle of coconut) juice in Jeison (Geova Manoel dos Santos) and Shirley (de Morais) attempting to care for the deceased when no one else appears much interested. Many of Marasco's compositions evoke the haunting and beatific passages that open another Malick movie, "A Thin Red Line." But whereas that establishing passage documented Jim Caviezel's Pvt. Witt seeming to find a sort of mystical Eden, the prevalent air currents of "August Winds" would seem to find something more foreboding. At one point Jeison talks of how the rocks in the ocean have "lungs", suggesting they are ineffably alive, and which distinctly alludes to the overriding notion of nature reclaiming this rock. Yet the film, in spite of its many shots showing the tide inching closer and closer, bit by bit, resists this notion. Its repeatedly decadent wide open frames of nature never come across terrifying, even when they are supposed to, only as reminders of its resplendence. And even if the wind recorder's dead body is shown without compromise, it is treated with a noticeable absence of pity, several local kids approaching it with whirling noisemakers as Jeison cleans it, their way of celebrating the life he must have led. We barely know him but we assume he must have gone out like Bodhi, dying doing what he loved, consumed by his meteorological environment.